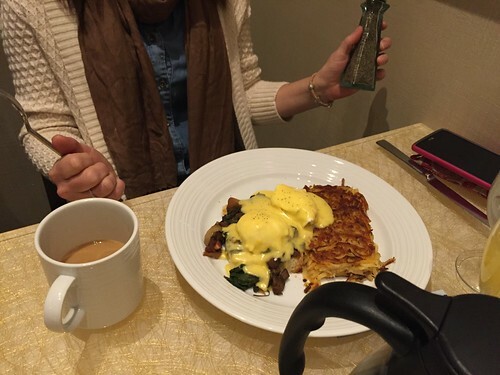 Posted on January 31, 2015 by Ching under Food and Drink, Travel. Yup. You guessed it. 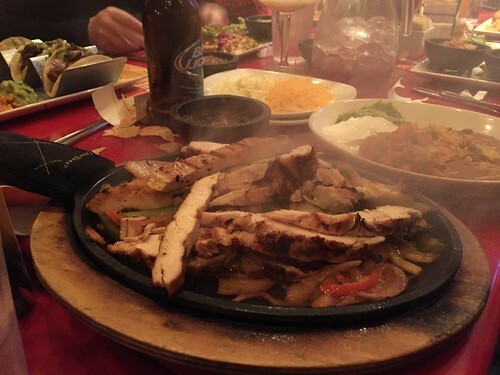 More pictures of food are coming your way. This happens when I get behind on blogging. Sorry, guys. We are almost caught up, though. One of my favorite aspects of traveling is trying restaurants that I wouldn’t find in Wichita and trying dishes that I wouldn’t normally get back home. 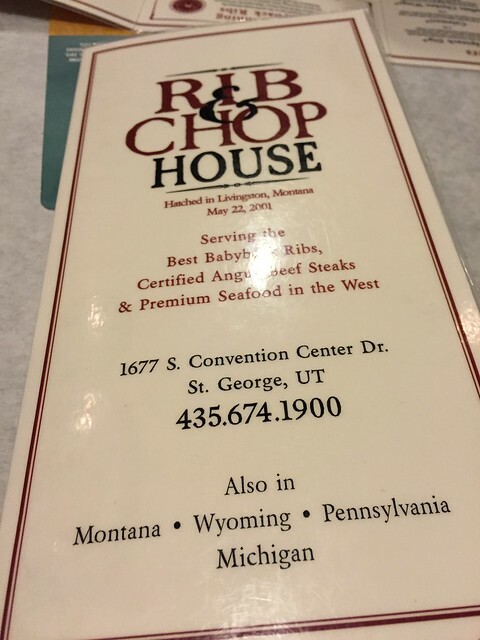 Our friends in Saint George took us to Rib & Chop House, a restaurant conveniently located next to our hotel. 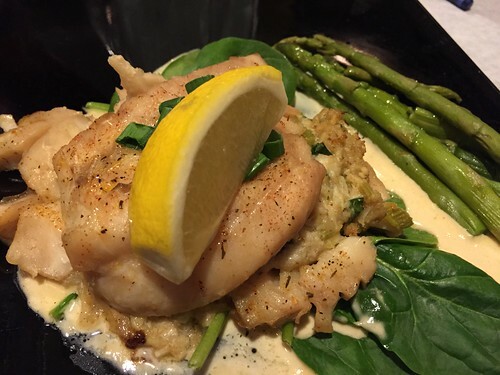 I had the stuffed red snapper with a side of asparagus (above). 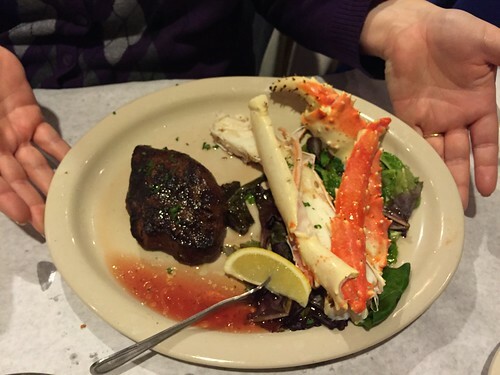 The filet was stuffed with crab meat. It was almost over the top. The dish was delicious but it was so rich that I couldn’t finish it all. It’s a shame too because I want to eat it again just thinking about it. I wish I could have found it in me to eat every single morsel. The surf and turf was popular with several people in our group. You could get with either lobster or crab legs. As soon as I saw the surf and turf plates arrive at the table, I regretted ordering the red snapper. The surf and turf plates looked amazing. 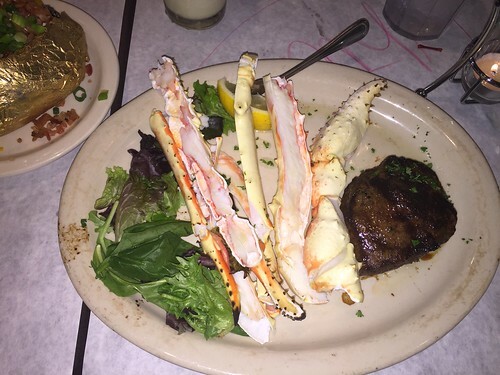 I didn’t order it because I didn’t want to fight crab legs which tend to be difficult to eat, but Rib & Chop House has pre-split the crab legs. They’re already cracked open so you don’t have to do any work. 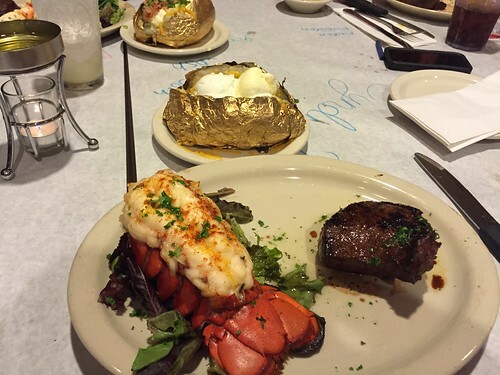 You just dig the meat out of the shell with your fork and chow down. It required little to no effort at all. 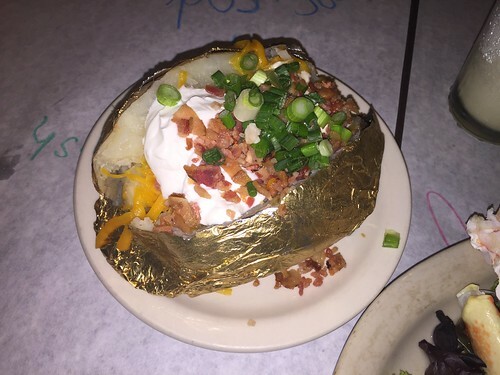 The restaurant also served mutant baked potatoes as a side option. That’s not what they’re called on the menu but that’s what they looked like to me because these potatoes were ginormous. Speaking of ginormous, check out this ice cream sandwich. 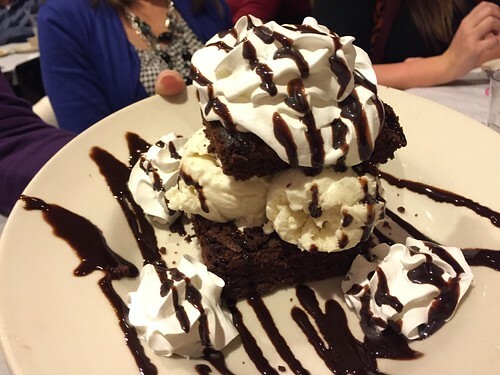 It’s not like any ice cream sandwich I’d ever seen. It was huge! I had to get a picture of Josh’s beer. That’s something else not readily available in Wichita. LOL. I’m not a beer drinker so I didn’t get to try it but now I wish I had. I mean, when will I ever return to Utah? Sometimes the things we regret most are the things we didn’t get to do. Oh, well. Maybe work will let me go again next year. 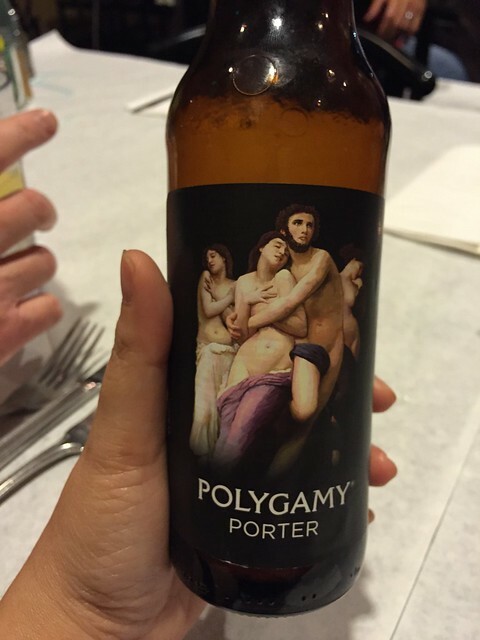 If so, I’m definitely having a Polygamy Porter. Bitter beer face and all. 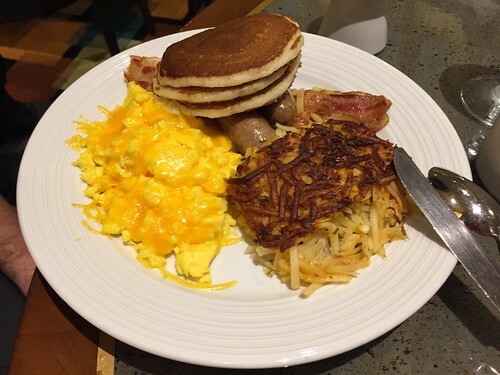 Posted on January 30, 2015 by Ching under Food and Drink, Travel. We always eat a lot on work trips. 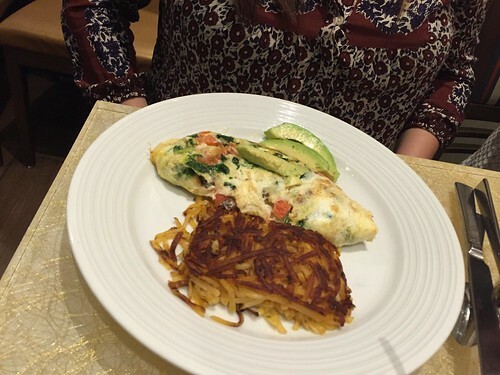 Here are a few more pictures of food. 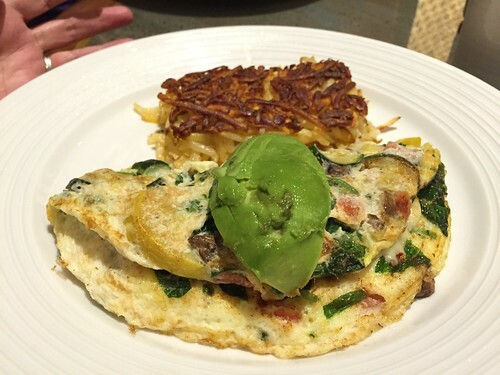 You’ll never go hungry when you stay at the MGM Grand. 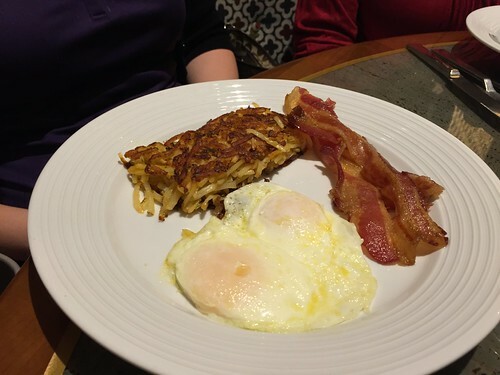 The casino resort is like a small city with dozens of dining options. Avenue Café is just one of several restaurants on site. 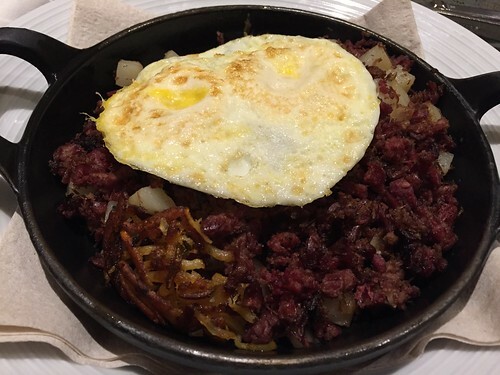 The best part about Avenue Café, besides the great food, is that breakfast is served all day (note that they close at 2 PM). If I had one complaint, it would be the price. $5 for a hot chocolate is a bit much. Then again, it is Vegas, so I guess that should be expected. I have no complaints about the food. I had breakfast there a couple of times and I liked what I had both times. They had several gluten free items and I even liked them. Also, it’s never too early to drink in Vegas. Even though Avenue Café is a breakfast place, they had a good cocktail selection — most notably the “manmosa” which is the manly version of a mimosa. It’s the exact same thing, except they serve it in a beer mug rather than a champagne flute. The champagne flutes are small and skinny so you don’t get much for $8. 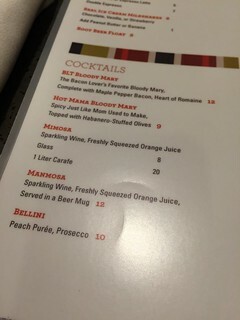 The $20 carafe is a better value because you get several champagne flutes worth. I only know because we had some on departure day. As tempting as it was, we didn’t have any the first time we were at Avenue Café because we don’t partake on work days. 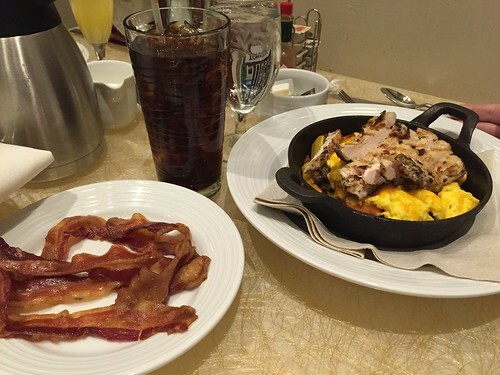 If you don’t mind paying a little bit more for breakfast, Avenue Café is a good, convenient option. It’s a straight shot from the MGM Grand lobby. I’d never been inside New York New York before. It’s actually pretty cool in there. They have the fake skies that make you feel like you’re outside though you’re inside the casino. The restaurant facades are made to look like you’re walking along a city street. 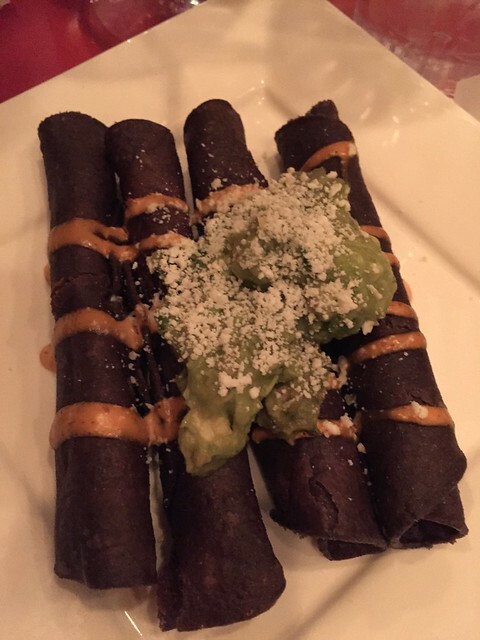 We ended up at New York New York because that’s where the Mexican restaurant Gonzalez Y Gonzalez is located. Gonzalez Y Gonzalez is the restaurant they picked for our first group dinner. The food is pretty good and the prices are reasonable. Here are some pictures. 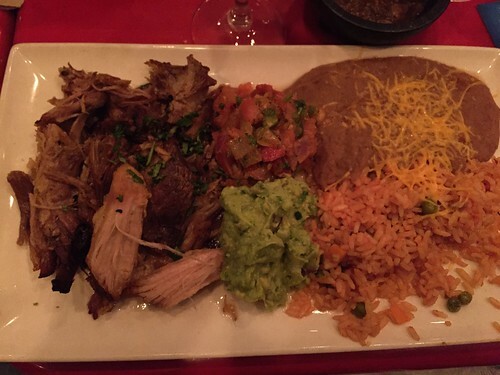 I had carnitas (above) while Isaac had fajitas (below). Dinner was good. I’m not sure what everyone else did after dinner. I was exhausted from the trip so it was an early night for me. 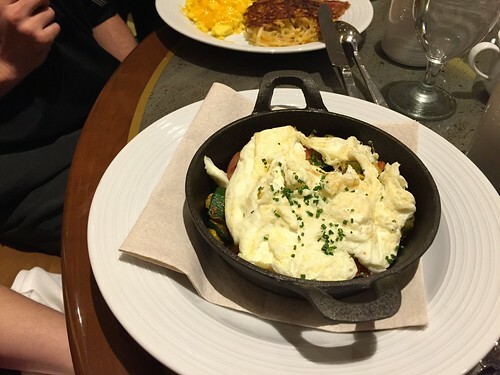 Posted on January 27, 2015 by Ching under Food and Drink, Travel. 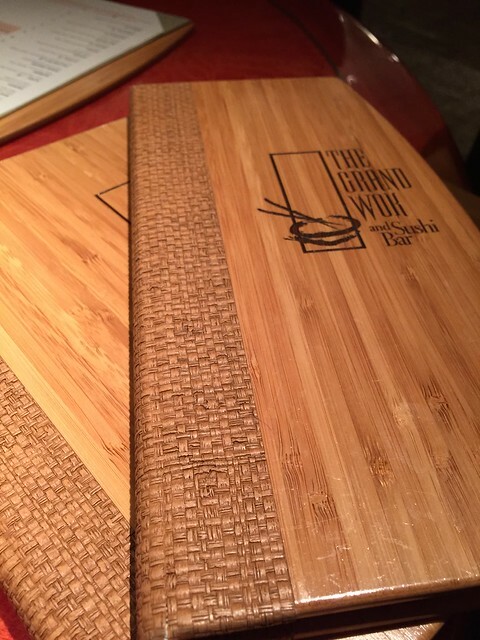 Ended up eating at the Grand Work and Sushi Bar a couple of times last week because (a) it was conveniently located inside the MGM Grand where we stayed a couple of nights and (b) the food wasn’t bad. Here are a couple of pictures… The photo above is of Amy’s crunchy. 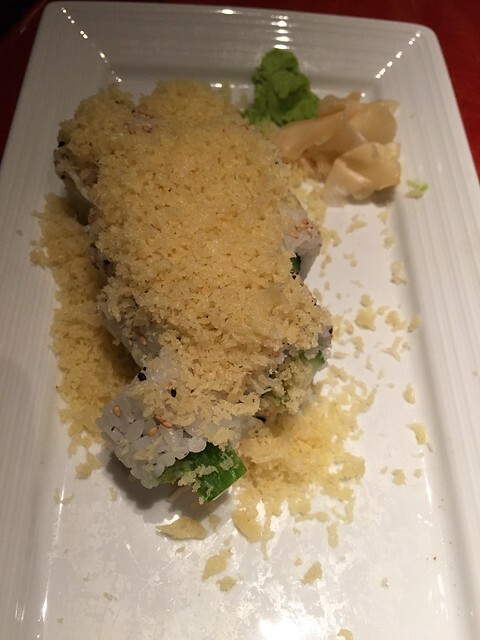 It’s like a California roll with crumbs on top. 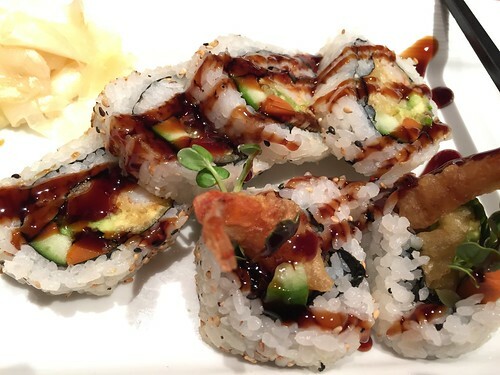 The one right below is their shrimp tempura roll. It’s a little different than the same roll at Wasabi because Grand Wok adds carrots to theirs. The roll was good but I prefer it the other way, without the carrots. I ate there the first time with Marsha, Amy, Isaac, and Josh. Everyone decided to do their own thing the second time around, so Tammie and I ended up having dinner together at Grand Wok after our walk along the Vegas strip. One of the best things about Grand Wok, besides sushi, is that they offer lots of vegetarian options. 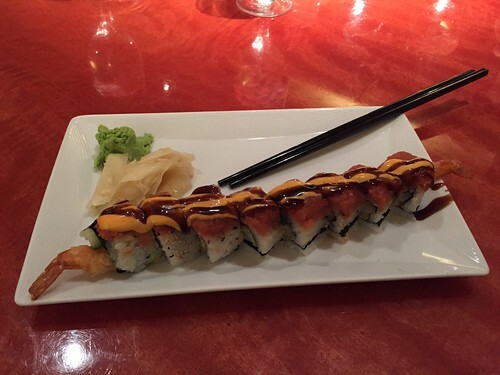 They also have lots of other items on the menu for those who don’t really feel like eating sushi. The only downside is that it’s a little pricy, but everything in Vegas is so that should come as no surprise. If you’re staying at MGM, the Grand Wok and Sushi Bar is a good option. 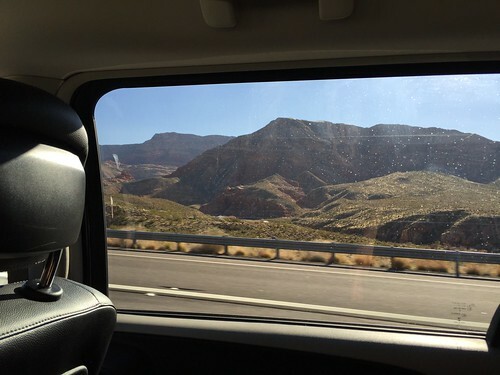 Posted on January 25, 2015 by Ching under Travel. I recently arrived back home from a work trip that spanned three different time zones in three days. I love traveling and wouldn’t mind it one bit if my work wanted me to travel 80% of the time, but this is the kind of traveling that make people who love to travel hate traveling. LOL. We moved to a different hotel every day so, in the three days I was away from home, I slept in three different hotel rooms. We made the best of it, though. Despite this being a work trip, we managed to have a ton of fun. 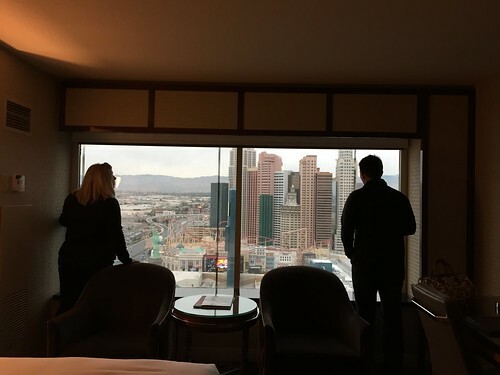 We stayed at the MGM Grand on our first night. 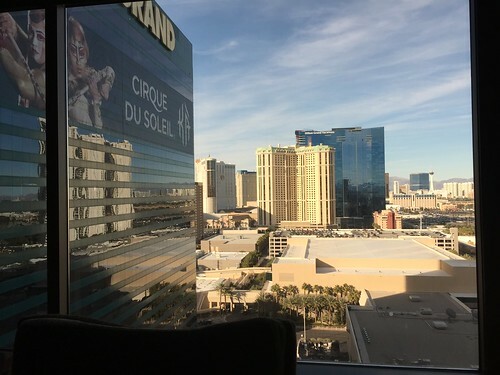 I’d been to Las Vegas a few times but this was my first time staying at MGM. There were several conventions going on in the area so the hotel was completely booked. I know. It’s amazing considering the MGM has over 5,000 rooms. The conventions going on must have been seriously massive conventions. I got a room with two double beds because it was what they had available at the time. I’m not fond of having two beds in my hotel room but we were only going to be there one night. 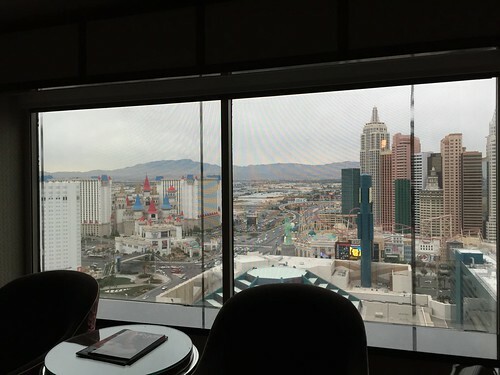 On the up side, I had a great view of New York New York and Excalibur. Mel and Isaac came up to admire my view and take pictures. 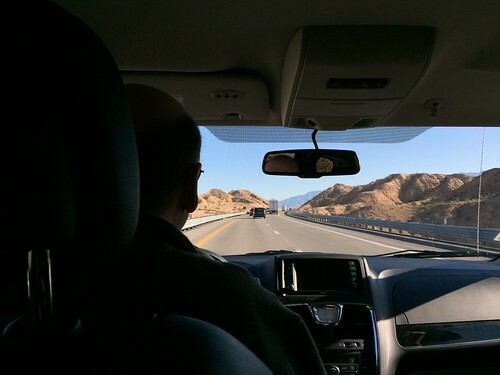 We all drove to Saint George (Utah) the next morning. The drive was breathtaking. I found a video of the exact route we took on YouTube. Check it out. Pictures do not do the sights justice. It just has to be experienced. Here’s a picture of my coworker Josh, taking a video. We spent the second night in Saint George. My hotel room at the Hilton Garden Inn had two double beds again. However, there was a mixup with our hotel reservation and they had it for the previous night instead of the correct night so I was just relieved that there were rooms available for us. 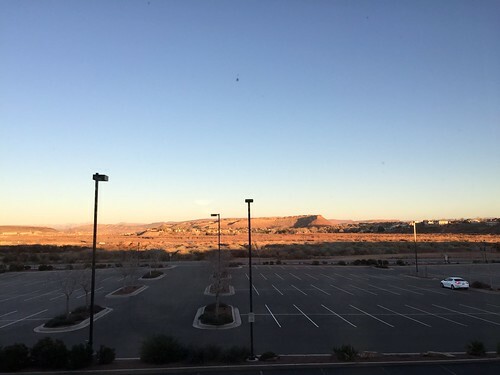 This is the view from my hotel room in Saint George. 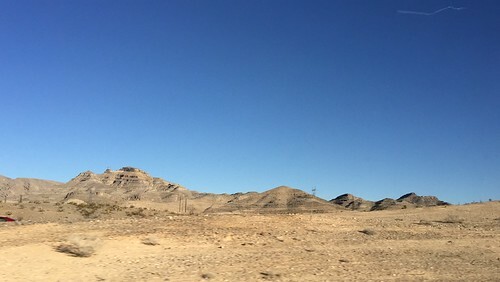 We drove back to Las Vegas the next day. We returned to the MGM for our final night. I had a room with a king bed this time. Hurrah! Most people don’t mind having the two beds in their hotel room because they use the other bed to lay out all of their stuff. I just don’t like how much floor space the second bed takes up. Look at all the room I had in my king bed room. I could have had a Zumba class! 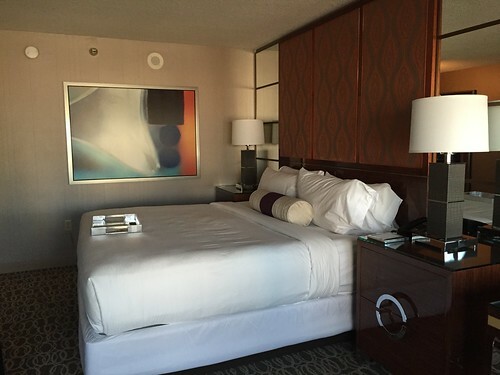 King rooms are so much more conducive to in-room workouts for times when you don’t feel like going to the hotel’s gym or when the hotel doesn’t have one or when you didn’t pack workout clothes. You can workout in your underwear in the privacy of your room. Rooms with double beds do not allow for this. Not that I worked out at all during this business trip, but it’s nice to have that option. LOL. My room was at the other side of the hotel this time around so I had a different view. Not as good as the other night, but still good. 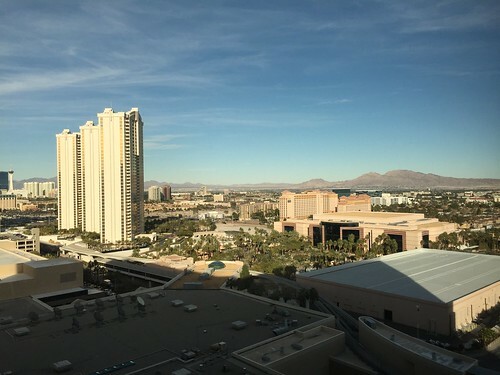 I could see the Stratosphere from my room. This trip is by far the most exhausting work trip I’ve ever taken, but the experience was great. I met some of the most amazing people in Saint George and I couldn’t have asked for better travel companions. Work trips aren’t typically fun but somehow we always manage to make the best of it. I have such awesome coworkers! P.S. 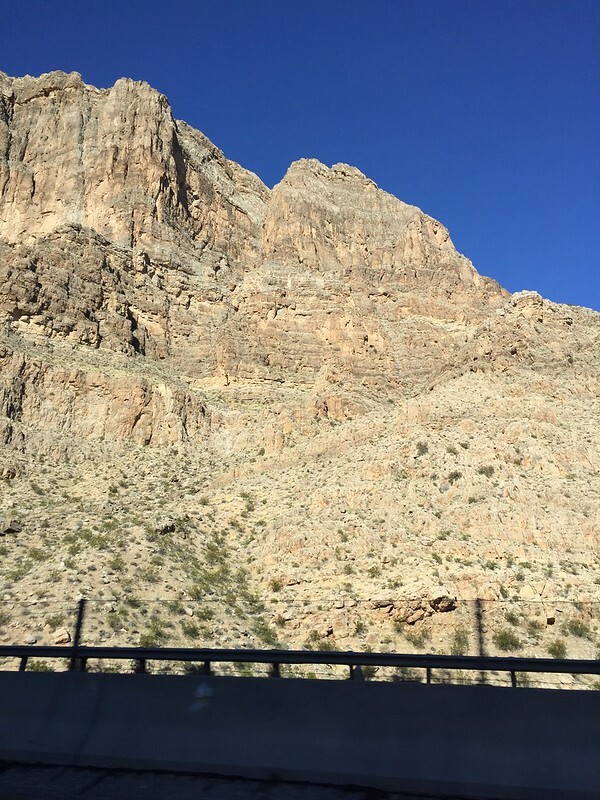 In case some of you were wondering about the title of this blog post, we went from Central Time (Wichita) to Pacific Time (Las Vegas) to Mountain Time (Saint George) and then back again.